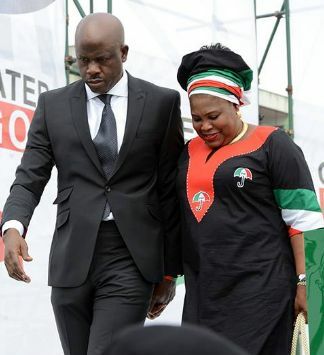 Operatives of the Department of State Service DSS, yesterday, arrested the wife of the former Minister of State for Defence, Senator Musiliu Obanikoro, over ongoing investigations into how her husband and two sons collected and laundered over N4.7 billion from the national treasury in 2014. The DSS had been working in collaboration with the Economic and Financial Crimes Commission, EFCC, to track the movement of Obanikoro and his associates linked with the transfer of the huge sum from the Office of the National Security Adviser, ONSA, to firms linked to them. Competent security source told Vanguard that Mrs. Obanikoro, whose husband was declared wanted only last month, was arrested in her Lagos home as she allegedly attempted to make away with vital documents related to the N4.7 billion case. The ex-minister's wife was however released on bail after the DSS transferred her to the Economic Financial Crimes Commission (EFCC) - her international passport was confiscated and asked to return on Monday, July 18, for interrogation. The DSS, according to report, moved to arrest Mrs. Obanikoro following information that she 'quietly' arrived in the country last weekend from the United States. “We got a report that Mrs. Obanikoro had sneaked into the country from the United States. After the confirmation of her travel log, an alert was issued to all security agencies," a source said. “Following intelligence sharing with the EFCC, the operatives of the DSS arrested her in Lagos with some documents relating to the probe of the N4.745billion slush funds from ONSA. Another source spoke of excitement about Mrs. Obanikoro’s arrest because “some of the funds under investigation were wired into her company, which is called MOB. “She needs to explain to this commission what job she did to deserve such remittance into her account”. Operatives of the EFCC had on June 14 raided Obanikoro’s Lagos home in continuation of investigation into the N4.7 billion that was traced to two of his sons. The amount in question was paid in many tranches from the ONSA account with the CBN into Sylvan McNamara Limited in Diamond Bank with account No. 0026223714, which they allegedly have interest. Of interest to the EFCC is the fact that all the transfers were done between June and December 2014, a period that coincided with the preparation for the Ekiti governorship poll which brought Governor Ayodele Fayose into office. A breakdown of the payment showed that the sum of N200 million was transferred into Sylvan Mc Namara’s account on June 5, 2015, while N2 billion was also wired into the account from the CBN/ Imprest Main account on June 16, 2016. Similarly, another transfer of N700 million landed on the account on July 7, 2014, while N1 billion was credited to the account on July 30, 2014. Other inflows into the account in question were: N160 million on August 8, 2014; N225 million on August 22, 2014; N200 million on November 14, 2014 and N200 million on December 5, 2014. “Both Gbolahan and Babajide Obanikoro, directors of the company, were also signatories to its account until 2014 when one Olalekan Ogunseye was made sole signatory to the account. EFCC is furious that the payments to the company from the office of the National Security Adviser were made without any valid contract between it and the Federal Government.